As I walk through the woods, the things that amaze me most about New England are the stonewalls (which I consider a greater feat than the Great Pyramids) and the apple trees. As I’m sure you are aware, there are no apple trees native to the Americas. All these trees came stock and seed from Europe, starting long before we were a nation. There are literally thousands of varieties, many of which grow wild in our woodlands, that are found nowhere else in the world. They are varieties that have no commercial value in today’s world, but are of extreme importance to the wildlife that depend to varying degrees on them. That’s why we were thrilled on our recent trip North of the Notches to see hundreds and hundreds of these trees in full bloom. It makes it so easy to see them for a few days a year when they are otherwise camouflaged into a green world of leaves and limbs. I call them wild trees because they are no longer in the care of humans and survive as best they can. Tens of thousands have died over the last century. I can find almost a hundred just here in town, but thousands still remain. Most of them are more, much more than 100 years old. Some twice that. The tree that I shot that buck from in Vermont in 1967, is a good example. It was, according to the farmer there, a hundred years old then, and last I knew it was still alive, 50 years later, having survived being mangled by bears and a lightning strike. So it should come as no surprise that I cherish them and help them, when possible by cutting out competing saplings and in some cases pruning and feeding them. This picture of the apple tree at J.E. shows how that effort pays off. A tree full of blossoms does not ensure fruit later, but a lack of blossoms equals no chance of fruit. Long live the apple tree! Most of you that will be reading this will remember back about 15 years ago, when the primary apple tree at J.E. was on its last legs. It was almost completely engulfed in maple saplings, had few leaves, and no fruit. I made it my mission to do what I had done hundreds of times before in three states—to liberate and rehabilitate it. After World War II, hundreds of farms in New England were abandoned for economic reasons. Almost every farm had apple trees, as they were a staple of life here for 300 years. For a time, wildlife benefitted from these now unprotected trees, but in no time at all they started dying from the crowding of native trees. Some state organizations, including Fish & Wildlife departments, took it upon themselves, on land they controlled, to make an effort to liberate them, as did I and my friends. So it was natural for me to take up that mission here in my own back yard. I started by cutting away the saplings with my pruning saw every time I went there. In a couple of years, the tree came back to life slowly. First with healthier foliage, and later with a few blossoms. Those blossoms produced a few small, wormy apples. Then John M. jumped in, and with some machinery from Charlie, eliminated the saplings entirely and enlarged the open area to allow more sunlight. It worked, and now most years we can count on 100 to 200 apples. Each year, I fertilize the tree in the spring and fall, and I prune it in late winter when I can reach the upper branches by standing on the snow rather than climb the tree. I put the wire mesh around the trunk when the beavers decided to try to take the tree down. My best guess is that the tree is 50 to 75 years old. I believe it is a New Hampshire heirloom variety that might be almost 200 years old. I hope to have it analyzed next year. Most of you are familiar with our own Johnny Appleseed, Mr. Jones. You are probably aware of the dozens of trees that he has planted, starting 50 years ago, on his property. What you are probably unaware of, is that he has planted hundreds of trees on every hilltop and slope for miles around. He goes out in the woods with a 5-gallon bucket filled with root stock and a spade, picks likely spots, and plants them. He does this out of a love for wildlife, even though—like almost all the great conservationists in history—he is a hunter. The only animals he distains are moose and bears. I bet you can guess why. They kill his apple trees. A fate that will happen to this tree someday. I came across an extremely agitated Mr. Jones one day. He was looking at three apple trees that he had nurtured for several years that a bull moose destroyed. The bull had eaten the apples, then the branches, then probably in a rush of passion, had obliterated the trees with his antlers. I, like Mr. Jones, have undertaken this mission for the benefit of wildlife. There are at least 20 mammals that have direct benefit of this tree, from moose to mice. Then there are the pure carnivores that benefit as well from the dozen or so rodents that frequent the tree. 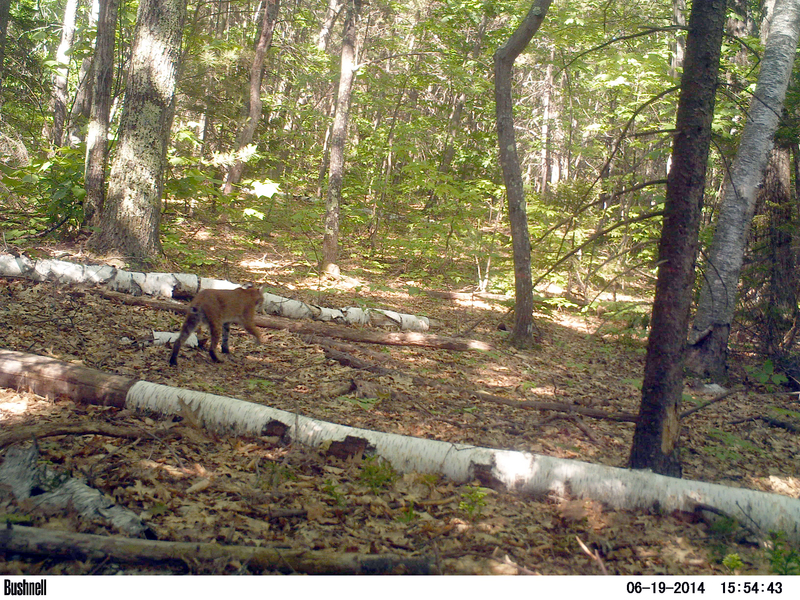 Our increasing bobcat population, mink, and three varieties of weasels are among them. It might surprise you to know that one of the larger members of the weasel family loves to eat apples. I have personally witnessed on two occasions, fisher cats first hunting the apple trees and failing that, then climbing the tree to harvest apples. One I witnessed making several trips to cache the fruit just like the foxes (both red and gray) do. Then, of course, our raptors—goshawks, sharp shinned, Cooper’s, and broad-winged hawks, and barred and great horned owls—greatly benefit from the rodents that live off of apples. Then there are the song birds—too many to list, but during my last trips to the tree, there has been an ovenbird each time, just for an example. Migrating birds, particularly Canadian robins and waxwings feed on the frozen fruit in winter. Turkeys benefit greatly from apple trees, especially in winter. Many times I have seen a bird fly into a tree and knock the apples to the ground for the rest of the flock. Fish & Game will supply you with a list of late ripening crab apple trees to plant for wintering turkeys. Ruffed grouse (“partridge” here in N.H.) not only eat the fruit, but love the leaves as I first witnessed that day in 1967, in my Deer Story blog post. The ground under the trees is fertile, attracts worms, and migrating woodcock. On several occasions in my life, I have been privileged to see flights, as they are called, of woodcock. Sometimes 50 or more come in to spend the night in an abandoned orchard. With all of the bobcat sightings this year, it didn’t come as a big surprise that a four-year study done by New Hampshire Fish and Game and UNH stated a significant increase in the bobcat population. The study, done largely by game cameras, showed that the statewide population has grown from a low of about 100 in the 1980s to between 800 and 1,200 today. The strongholds for the bobcat population are the southwest corner of the state and in the north on the Notches, but they are now in every area of the state. 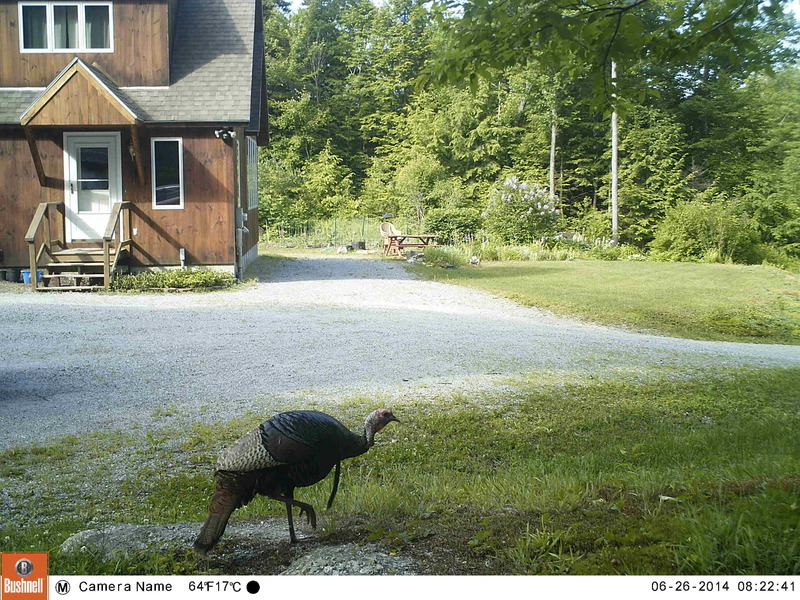 One of the major reasons for the increase in the bobcat population was a corresponding increase in the turkey population. Bobcats have an advantage over coyotes in pursuit of turkeys because of their climbing ability.